Several miles south of the East Lothian town of Gifford on a high roughly triangular promontory where the Hopes water merges with a lesser burn sits the broken remains of Yester castle. Consisting of a fragmented vaulted keep on the east side and at the apex of the site a section of 14th century curtain wall, showing evidence of lean-to buildings with a small postern gate. Underneath this 14th century masonry is the famous subterranean Goblin Hall, presumably created by mysterious forces. In reality it is but the basement vault of the original rectangular keep first raised by the alleged wizard Hugh de Gifford some time before 1267. This Gifford keep was illegally occupied by the English in 1308 and was consequently stormed by the Scots then cast down to ground level in accord with King Robert the Bruce's (1306-1329)policy of making castles unserviceable to the English. After the turbulent years of the wars of Independence Yester was rebuilt as a courtyard castle. On the south side of the site today is a dry fosse about 50ft.wide by 20.ft deep. Originally this was water filled as a stepped dam wall running from east keep divided the Hopes water so that half carried on it's usual route and half ran across the fosse to meet the lesser burn creating a three sided moat. In 1357 Yester passed by marriage to the Hays. The name Hay dates back to 8th century France. Although in Hector Boece's fables a farmer called Hay and his two sons helped defeat the Danes at the battle of Luncarty in 971 AD. Certainly the Hay heraldry consists of three spade shaped escutcheons which supposedly represent the bloody farm implements used by the Hay trio to dispatch the 'viking' raiders. Returning to recorded history a La Haya de Puits was a commander with William the Conqueror's army in 1066. A William de Haya was butler to King William 'the Lion' of Scots (1165-1214). Also de Haya's eldest son was one of several hostages held in England with the King of Scots after he was betrayed and captured at the siege of Alnwick castle in 1174. On the King's return to Scotland de Haya's two sons were granted the lands of Erroll in the north and Tweeddale in the south. De Haya's younger son Robert became the ancestor of the Hays of Yester. Sir Gilbert De la Hay,3rd Lord of Erroll was co-regent of Scotland in 1225 and married Lady Idonea Comyn,their son Gilbert fought for King Robert the Bruce he was rewarded with the lands of Slains, near Aberdeen and hereditary position of Lord High Constable of Scotland. In May 1400 William Hay of Yester accompanied George the 'Red' Douglas Earl of Angus of Tantallon castle to a meeting at Bothwell castle with Archibald the 'Grim' 3rd Earl of Douglas, to defuse an ongoing feud between the 'Red' Douglas and James Douglas of Dalkeith (Archibald's ally) over possession of the lands of Liddesdale. The 'Red' Douglas and his allies had burnt the lands around Dalkeith castle and other estates throughout Scotland "To recover from James Douglas all mails and rents of Liddesdale which he wrongfully occupies." Eventually an agreement was made where the 'Red' Douglas faction would end their attacks in exchange for some of the Liddesdale lands. In 1402 William Hay of Yester marched on Newcastle with the Scots army under the command of Archibald 4th Earl of Douglas. After retiring from Northumberland the Scots carrying much booty were intercepted and routed by 'Hotspur' Percy and his expert Welsh archers at the battle of Homildon Hill, near Wooler. William Hay along with the Earl of Douglas was among the many nobles unhorsed and captured during the battle. By 1403 Hay of Yester was back in Scotland signing land charters for the still captive Earl of Douglas. At this time a dispute arose between the Percies and King Henry IV of England over who could claim the ransom money for the many Scots nobles taken at Homildon. This led to open rebellion where 'Hotspur' Percy led Welsh and English rebels against King Henry at the battle of Shrewsbury. During the battle 'Hotspur' was killed and the rebels defeated. In 1406 a form of rebellion was also brewing in Scotland. The Stewart of Albany the ambitious brother of the weak willed King Robert III of Scots (1390 -1406) who had been responsible for the death of Prince David at Falkland Palace was plotting to kill Robert's remaining son Prince James. So rushed plans were made to send the Prince abroad. For some strange reason David Flemming with Prince James and the 'leading men of Lothian' tried to seize Tantallon castle from the young 'Red' Douglas who's father had died after Homildon Hill possibly in an effort to use this as a safe stronghold to house the Prince before his evacuation to France. However the 'Red' Douglas's grandmother, a fiery individual and her kin the Sinclairs of Herdmanston were in no mood for political games and their verbal rebuke broke out into actual violence with Flemming and his 'strong band' fleeing with the Prince to the nearby North Berwick castle. From here the Prince was taken to the even safer Bass Rock Island castle opposite Tantallon in the Firth of Forth, to await a ship to France. Meanwhile the decoy royal army led by Flemming raced from North Berwick back up the coast drawing a rebel army out from Edinburgh castle led by James the 'Gross' Douglas (an ally of Albany). The royal army was 'overtaken' and routed at the battle of long Hermiston Moor and Flemming killed. Unfortunately all this sacrifice was for nothing for the Prince en route to France was captured by the English and held captive for 18years. In 1407 the Earl of Douglas appointed 'his very dear squire' William Hay as Sheriff of Peebles. Later he also gave Hay lands in Galloway. By 1418 Douglas ordered his men to 'impose distress' on the people of Galloway for refusing to pay their rent to their new Master William Hay. Showing that he like his father Archibald the 'Grim' ruled by fear and force of arms. In 1409 Margaret, daughter of William Hay married William the 'Red' Douglas 2nd Earl of Angus in an attempt to bring the 'Red' Douglases back into the fold of the 'Black' Douglas camp. With the death of William Hay in 1420 his son Thomas took over as Lord of Yester and started a dispute with the Borthwicks of Borthwick castle, Mid Lothian also 'Black' Douglas vassals. Which led to local Lothian violence with the 'Red' Douglases delighted to help the Hays in their attacks, because they were protecting their 'in laws' . This minor civil war continued until Prince James, now King James I (1406-1437) returned to Scotland in 1424. In 1478 John Hay was created Baron Yester of Yester. In 1513 Baron Yester and his kinsman Hay Earl of Erroll of Slains castle, near Aberdeen gathered their forces together and marched south with King James IV of Scots (1488-1513) to harry the north of England. The King was also joined in this venture by several other noble Lairds, the aged Archibald 'Bell-the-cat' Douglas of Tantallon castle. Lord Borthwick of Borthwick castle (the King's cannon commander) , Lord Lyndsay of Byres castle, near Haddington and the Border veteran Lord Home of Home castle. When the English did arrive they began filing across the valley towards Branxton ridge cutting off the Scots retreat route. Lord Borthwick pleaded with the King to let him fire a barrage on the English before they reached the other ridge. King James dismissed this suggestion as unchivalrous and insisted a salute was fired to acknowledge their arrival. Interestingly this salute was viewed as incompetence by the English who assumed the Scots gunners were firing over their heads unable to gauge their position. Lord Lyndsay begged the King to allow him to charge with his horsemen down the hillside to divide the English before they could assemble. Once again the King refused the sound guidance of his men and threatened to hang Lord Lyndsay from the gate of Byres castle on his return to Scotland if he did not hold his position. After the English had assembled and heralds had exchanged various demands a short cannon bombardment between the armies ensued in which the Scots came off worst. Lord Home's mounted Borderers charged across the valley and routed the English right flank. Instead of following up this success the Homes simply collected booty from the dead and fled the field. Lord Home suggested let the King do as well. King James leapt from his horse planning to lead his pikemen on foot. The Douglas brothers implied that this was lunacy. Angered by this rebuke the King tore his royal surcoat from his breast plate to show that he was fighting as an ordinary man-at-arms and demanded that his nobles climb down off their horses and descend on foot with the pikemen. The nobles did as they were commanded, King JamesIV, the Douglases, Baron Yester of Yester,Hay Earl of Erroll and many other Lords were all killed. From 1544 to 1549 the English failed to bring about the marriage of Mary Queen of Scots (1542-1587) to the English Prince Edward by use of bribes and hence had resorted to force burning castles and villages throughout Scotland. So the days became known as the wars of the 'Rough Wooing'. In 1547 Yester castle was attacked by a small English pioneer force, while the main army marched up the coast from Berwick in sight of the English fleet. The castle was strongly defended by the 4th Baron Yester and eventually the pioneers abandoned their siege and moved northwards to link with the main English army and fleet at Pinkie near Musselburgh. Baron Yester also fought and distinguished himself at the battle of Pinkie, where the Scots army were totally annihilated by combined use of land and ship based bombardment. The Baron was thrown from his horse in the confused Scots retreat, captured by the English then imprisoned in the Tower of London for three years. 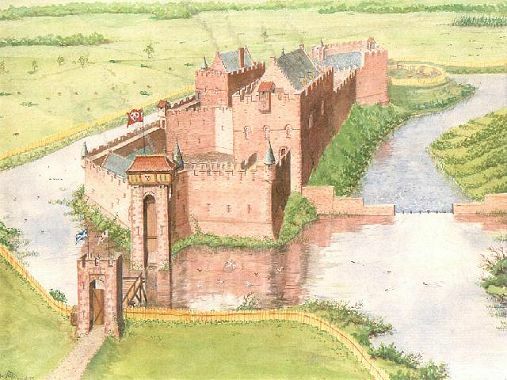 After Pinkie the English planned to secure a permanent base at Haddington and to ensure this base's safety, castles in the immediate vicinity were to be seized. In 1548 Yester was one of the first targets to be stormed by the English with the aid of local 'assured Scots' who favoured the marriage of Mary to Edward. Soon after Yester was again re-captured by the Scots and the 'assured Scots' punished. Cockburn of Ormiston, Douglas of Longniddry and Lord Brunstane all had their Towers burnt. In 1557 William Hay 5th Baron Yester abandoned Yester castle as a residence in favour of a new Towerhouse nearby on the site of the present day Adam's style Yester house. By the late 1600's Yester was already in a very ruined state as recorded in prints of the day. As with so many other Lothian castles it became used as the local quarry and like a child's sandcastle being swept away by the tide, more and more masonry was swept away as time progressed leaving the fragmented, mysterious ruin that we see today.